I am submitting this piece of art to the Illustration Friday's weekly challenge which is "Talented"
This is a drawing of my pets painting a picture of my Husband Mark and I and our two dogs, Angel and Frankie. 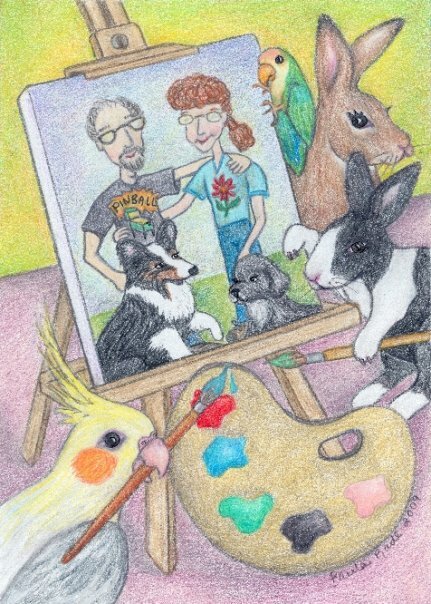 The cockatiel "Baby Bird", lovebird "Lillian", Dutch rabbit "Jazzy" and Rex rabbit "Donut" are the artist's. I think they did an awesome job, better than I could have done because I don't draw realistic people very well, they are very talented animals.. So cute, Paula. Following you here now. Hope you'll follow on mine too.